We review the experimental observations of meter scale plasma irregularities in the auroral E region and the status of their theoretical understanding. Most of the experimental data is derived from VHF radar scatter experiments, but sounding rockets also provide crucial information not obtainable from radars. Linear theories correctly predict the altitude of occurence, strong magnetic aspect sensitivity, marginal instability, and typical phase velocities. Subsequent nonlinear theories have been developed to account for other observed features but with less satisfying application. Further understanding of auroral electrojet irregularities is impeded by precision limitations of existing instruments, by radar data which may seem incompatible, by the usually poor knowledge of the ambient conditions during these experiments, and by some confusion in the nomenclature (e.g. “type 2”) used to describe the irregularities. We hope to clarify some of these experimental and theoretical issues. We will discuss observational “facts” that need to be refined and point out weaknesses of existing theories or their common interpretations. Finally, we will outline some avenues for future experimental and theoretical pursuit. 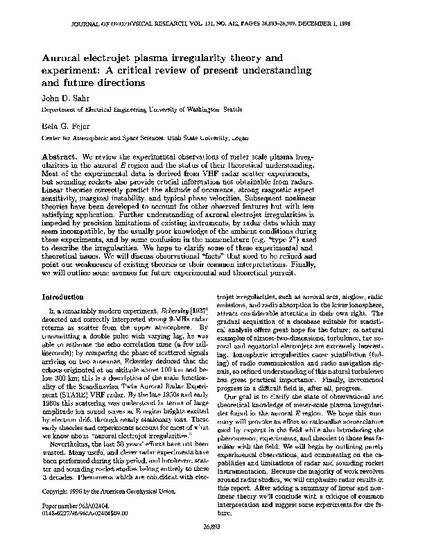 Sahr, J. D. and B. G. Fejer, Auroral electrojet irregularity theory and experiment: A critical review of present understanding and future directions, J. Geophys. Res., 101, 26,893, 1996.